NEW BRITAIN - Big time players come through in clutch situations. 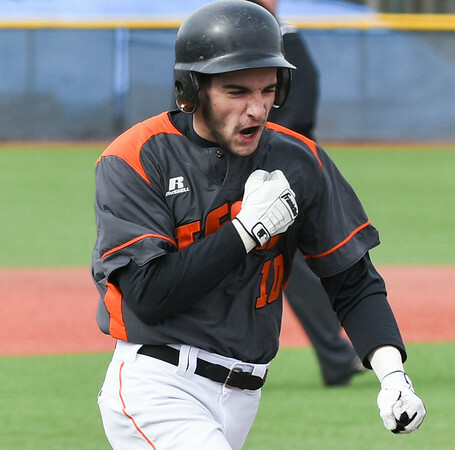 Goodwin Tech baseball’s Paul Prior was the epitome of that on Friday afternoon as he launched a two-strike, walk-off grand slam to beat Prince Tech 7-5. Prior also added a double in the game for the Gladiators, who moved to 2-3 on the season with the win. Chris Ryan picked up the win for Goodwin Tech. “It was a good win for us,” Gladiators head coach Joe Granja said. Wethersfield 2, New Britain 1: Daniel Rivera (2-for-3) ripped a double in the game and Will Homar pitched strong for the Hurricanes. New Britain couldn’t get any offense going outside of Rivera though. Homar threw a complete game, giving up two runs, only one of which was earned. “Will pitched great for us today,” New Britain head coach Roberto Mercado said. Fitch 13, Southington 12: Fitch scored two runs in the top of the seventh to take the win. The Blue Knights scored all 12 of their runs over the first three innings, but the Falcons began making their comeback in the bottom of the third, scoring seven runs to get the game to 12-8. Bryce Worth took the loss for Southington. New Britain 9, Bolton 3: Gianna Gonzalez went 5 1/3 innings with 10 strikeouts and added a double and a triple for the Hurricanes. Joseleen Rivera also had a double and New Britain moved to 3-1 on the season. But the story of the game was the performance of catcher Chasity Sanchez,w ho played through the game sick. Stonington 4, Newington 3: The Indians could only win one singles match, which proved to be the difference. Matt Utter won at second singles, 6-2, 7-5. Josh Ellis and Luke Klin (second doubles) won 3-6, 6-3, 6-2. Taras Panchshyn and Michael Zhai won at third doubles 1-6, 6-3, 10-5. Newington 3, Lewis Mills 2: In a matchup of unbeatens the Indians got strong performances out of Leonel Caceres (14 kills), Louis Egbuna (13 kills), Teddy Fravel (13 kills, 5 blocks) and Dan Cloutier (44 assists, 4 blocks). Newington moved to 5-0 on the season. Posted in New Britain Herald, Goodwin Tech, New Britain, Newington, Southington on Friday, 13 April 2018 21:24. Updated: Friday, 13 April 2018 21:29.